The ChromaLuxe® by Unisub® Hanging Photo Mural - in white or clear gloss aluminum. 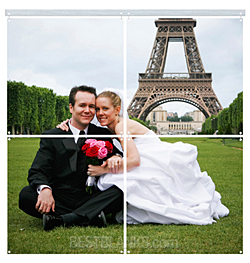 Create a unique high definition photo panel arrangement for your customers in clear or white gloss aluminum. Design options include a straight and wavy square tile shape with widths from one to four feet, hanging from a brushed silver bar. This exciting new addition can turn any candid or professional photo into an amazing wall mural piece. ChromaLuxe® Gloss Clear 5.85"x5.85" Small Wavy Photo Tile. Hardware sold separately. See below. 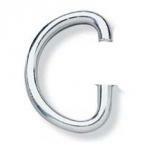 ChromaLuxe® Gloss White 11.7"x11.7" Large Square Photo Tile. 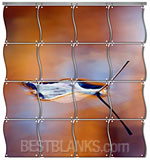 ChromaLuxe® Gloss Clear 11.7"x11.7" Large Square Photo Tile. (25 Per Bag) Sold By The Bag.